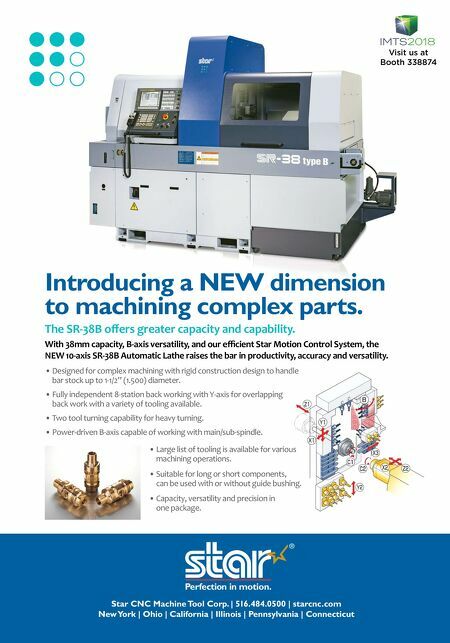 CNC TECH TALK MMS JULY 2018 38 mmsonline.com Processes and Programming Spreadsheets Enable Calculations Similar to CAM Software You probably use spreadsheets ever y day. They are great for a multitude of applica- tions—ever ything from creating grocer y lists to organizing your company's production information. If you program CNCs, you prob- ably use a computer-aided manufacturing (CAM) system. But did you know that you can get a spreadsheet to behave like a uniquely customizable CAM system? Obvious spreadsheet features, such as enter- ing data into cells or displaying calculated results in others, along with the ability to format results as strings of data, enable the creation of G-code commands that consider and manipulate current values in input-data fields. Running through an example can illustrate how a spreadsheet can function like CAM soft- ware. Consider this: spreadsheet cell J7 con- tains the diameter of a milling cutter that will machine a contour. Other cells contain input data about the contour, but let's keep it simple for now. The X-axis-approach position for this milling cutter will be to the left (X negative side) of the program origin by the cutter radius plus a 0.1-inch-approach distance. For a 1.0-inch cutter, the required G-code command will be: G00 X-0.6 Here is a Microsoft Excel spreadsheet formula that will generate the required command: ="G00 X-" & FIXED(J7/2+0.1,4) The equal sign begins a formula. Quotations surround a text string. The ampersand specifies information that will be added to the text/data. The "fixed" function enables the specification of decimal point values. Note the "4" after the comma specifies that the calculated value will be displayed to four places. Looking at the calculation within the parenthe- ses, the current value of cell J7 is 1.0. 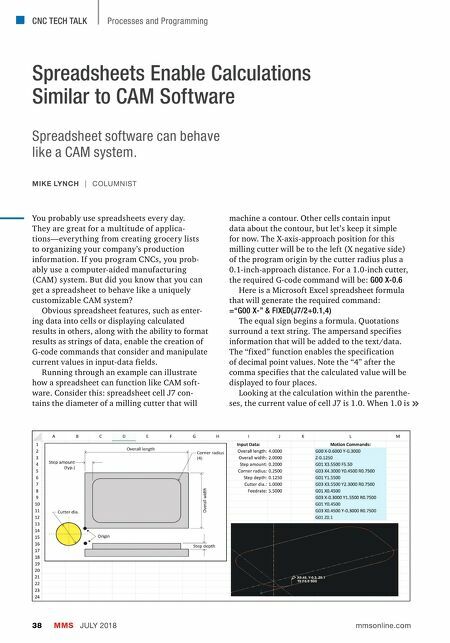 When 1.0 is MIKE LYNCH | COLUMNIST Spreadsheet software can behave like a CAM system.